When I was posted in Raichur, the nearest place where I could do river rafting is in dandeli, and we could not do there because of non-availability of right time during the right season. 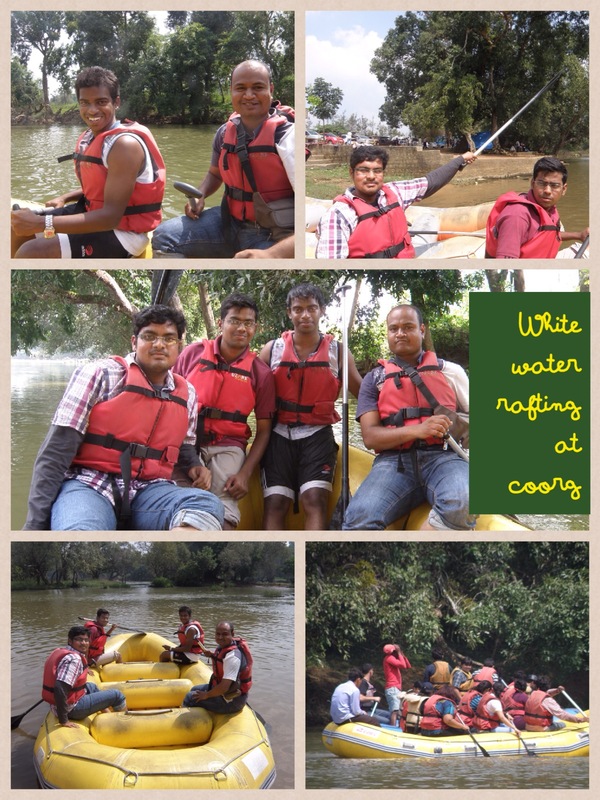 We googled and found that rafting is done in madikeri. And once I got my transfer order to mangalore, I was really happy to go there, so that I will definitely get an opportunity to raft at madikeri. The first time we visited madikeri, we could do only still water rafting as the water level is very low. We waited for a year for the right season and this time we succeeded. By this time we had already visited madikeri three times. It was an exhilarating experience. Only one of us know swimming and the rest of us are crowbars. We had to keep the cameras in our bags as they are not water proof. I was wondering whether to take my mobile phone in a cover to take photos and our guide advised not to. I obeyed him, only to regret later. Happiness doubles by sharing and the best method of sharing is by showing photographs and some boasting to those who haven’t done. The first time when we jump into the water, with life jacket, but without knowing how to swim, is indeed a great experience. You overcome your fear of drowning for the rest of your life when you take the first plunge. The first step is the most difficult one and you feel like you have achieved something big. Indeed it is a milestone in your personal life. The first plunge in the cauvery river, aroused my desire to learn swimming exceedingly. We floated with the help of life jacket for a while and then climbed back to the raft, and left madikeri with a memorable experience. It was the experience which made me fall in love with river rafting.